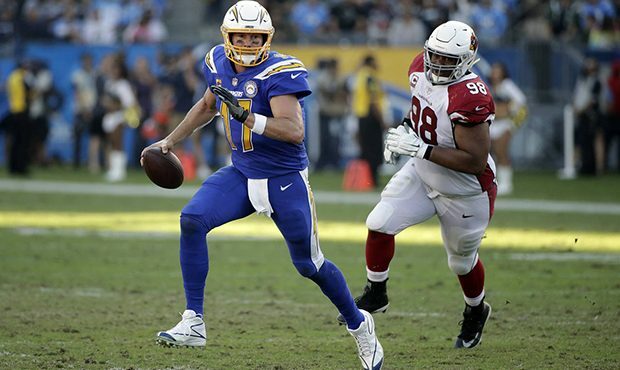 It was a record breaking day for Chargers QB Philip Rivers, as he broke a couple records in the Chargers route of the Arizona Cardinals, winning easily 45-10. It didn’t start all sunny for the Bolts, who fell behind the Cards early 10-0, but once they settled down, Rivers could not be stopped, setting a NFL record with 25 straight first half completions. On the day he went 28 of 29 for 259 yards and three touchdowns in three quarters. It was also his 11th straight game with multiple TD passes. He set two marks in the huge win, tying the NFL record for consecutive completions and set marks for the most to start a game and the highest percentage in a game. Mike Williams and Melvin Gordon each had two touchdowns in the runaway win for Los Angeles. Gordon, who came into the game sixth in the league in rushing, had 61 yards on 10 carries before suffering a knee injury during the third quarter. Be the first to comment on "Los Angeles Chargers QB Philip Rivers Goes 28-for-29 with Three TD’s in 45-10 Win Over Cardinals"